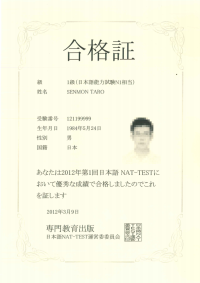 All test takers of the Japanese Language NAT-TEST will receive a detailed score report. On the score report will be printed not only your general score but also a breakdown of the different sections and how you performed on them. Your strong suits and weak points on the test will be visible at a glance. This is also a great tool to use in your future Japanese studies. For those who receive a passing score, a certificate of proficiency will be issued as well with your picture attached to it. You can use this as a means to demonstrate your ability in Japanese to any future schools, employers, etc. On your score report we will print out your general score, ranking, points, average score and grade for each individual section: Language Knowledge (vocabulary/reading), Language Knowledge (grammar), Reading Comprehension, and Listening. The score report is printed on a light green A4 sized sheet of paper. 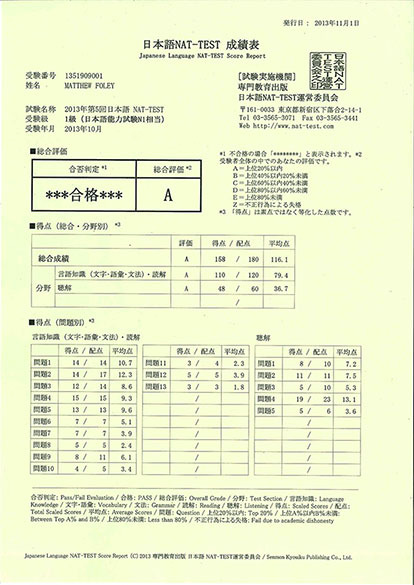 The certificate of proficiency is printed on a cream colored A4 sheet of paper and has the test taker’s photograph attached to it. Because these are exclusively printed at our head office in Tokyo, the formatting and paper used are identical on all documentation. The seal we use is printed in black and white.